Fermented soya product, mango, with added calcium and vitamins. More fruit no added sugars. Enjoy plant power. Only sugars from fruit. Soya with yogurt cultures. Enjoy the fruity taste of Mango! Source of calcium. Source of plant protein. Naturally lactose free. Naturally low in fat. No sweeteners. Free from dairy and gluten. European Vegetarian Union. Vegan. 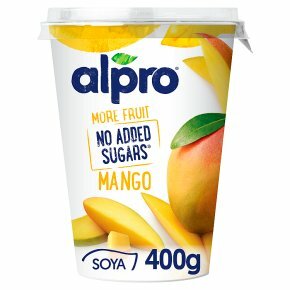 No added sugar* *Contains only naturally occurring sugars from fruit.